This morning’s three hour journey through Villeray and Central Rosemont provided little in the way of good finds. I came out with only a modern oil lamp and a plain but nicely hand-crafted stein. Nice pieces to be sure, but nothing to write home about. I think I figured out the case of the disappearing garbage: Rosemont has a new composting program which has significantly changed the garbage collection schedule. In most cases one of the formerly two garbage days are now composting days. This might actually benefit me as there should be less kitchen waste on the curb and more “good” trash out on the actual collection day. Most of the alternate trash days appear to be later in the week, so starting Thursday I hope to once again make some good Rosemont finds. Now that it’s wild apple season I’m able to indulge in some free, tasty treats while on the road! 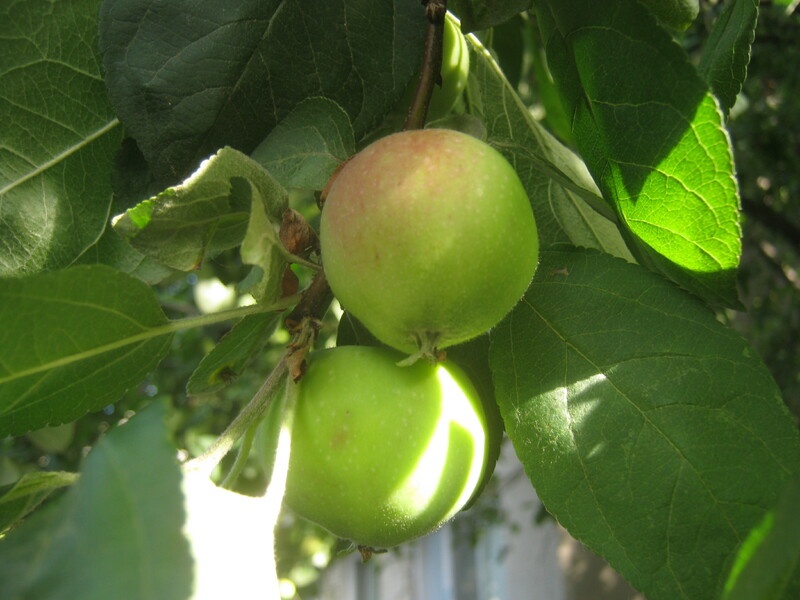 Apple trees are plentiful around here and I already have a few favourite trees I know to visit. I’ve also seen some pears and grapes which should be ready in the next few weeks. It’s a nice and unexpected perk to summer trash picking. My evening run through the Plateau was fairly dry as well. The only interesting thing I found was in this pile on Cartier. It seemed like an older person’s stuff. I saw nuts and bolts in old jars, a newspaper from the days of Expo 67 (which was unfortunately in poor enough condition to not be worth taking), and empty vials with the symbols of chemical compounds printed on them. Sort of interesting to look through but in the end this stuff was mostly junk. 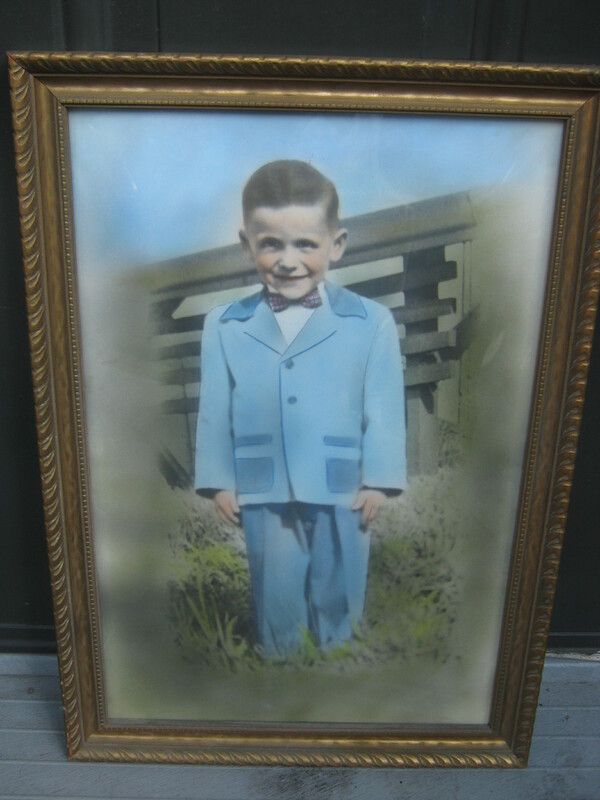 I took the nuts and bolts as well as this framed photograph. It looks to be one of those hand-coloured photos from back in the day. Hand-colouring dates back to the beginnings of photography but the “golden age,” according to wikipedia, was from 1900-1940. I’d guess this picture is from that time period. It measures around a foot high, definitely bigger than your average photo. The edges are intentionally blurred and the colouring is almost cartoon-ish. The combination makes the picture look a bit dream-like. 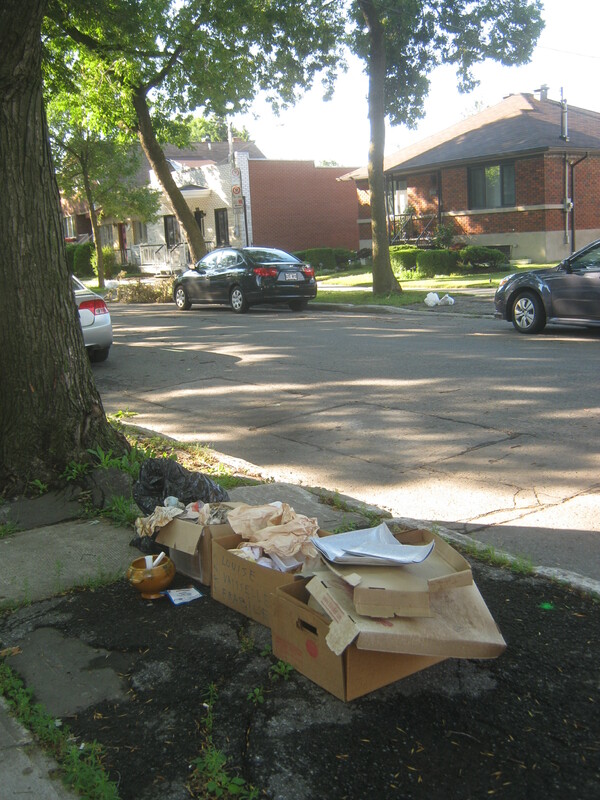 I’m contemplating going to Verdun later tonight or tomorrow morning to check out a trash day there. It’s the end of the month so if I’m going to go way out my way for trash now is the time. The neighbourhood of Rosemont / La Petite Patrie, or at least the section between Parc and Papineau, has been my regular Monday and Thursday morning route all year. Recently, however, I’ve gone and found many of the streets mostly barren, save for a few uninteresting bags here and there. It’s almost like it’s not trash day at all, or perhaps as if the truck had already passed, though I very much doubt the truck would come before 7 in the morning. I just checked the schedule online and it still looks as if Monday and Thursday mornings are the time to go. They say to put out the trash between 5 and 8 AM. The only thing I can think of is that the trucks come a little later, maybe in the afternoon. Anticipating disappointment I devised a “Plan B” which took me to the borough of Saint-Michel. I don’t know the area too well so my route was relatively chaotic. 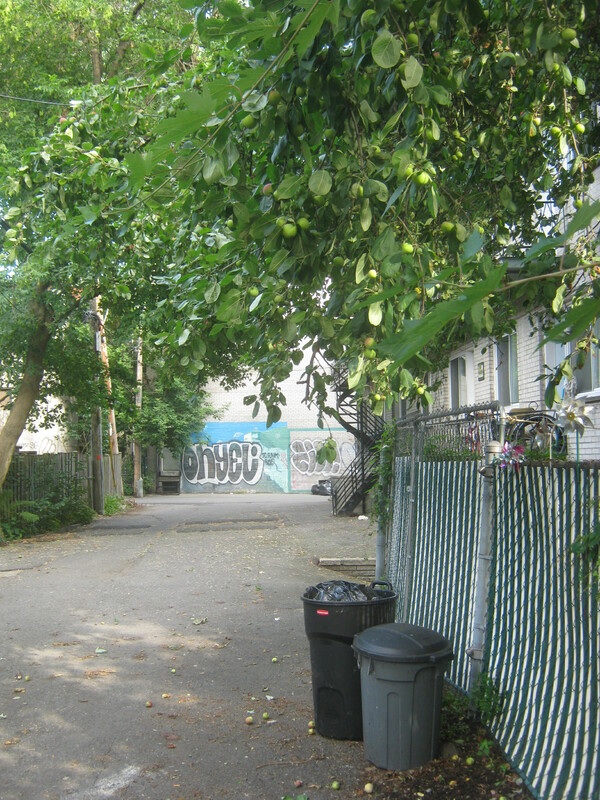 Some of Saint-Michel is fairly low income and I’m optimistic about finding anything good there. Other parts, however, are sufficiently middle-class to be reasonably promising. St Michel differs from Rosemont, the Plateau, Villeray and other Montreal boroughs in the fact that many of the homes are built for single families, while in these other neighbourhoods it is more common to see three-storey buildings that might contain up to five different apartments linked together for a whole block. That means the population density is much lower, which is bad for me because I have to bike that much more to see the same amount of individual people’s garbage. 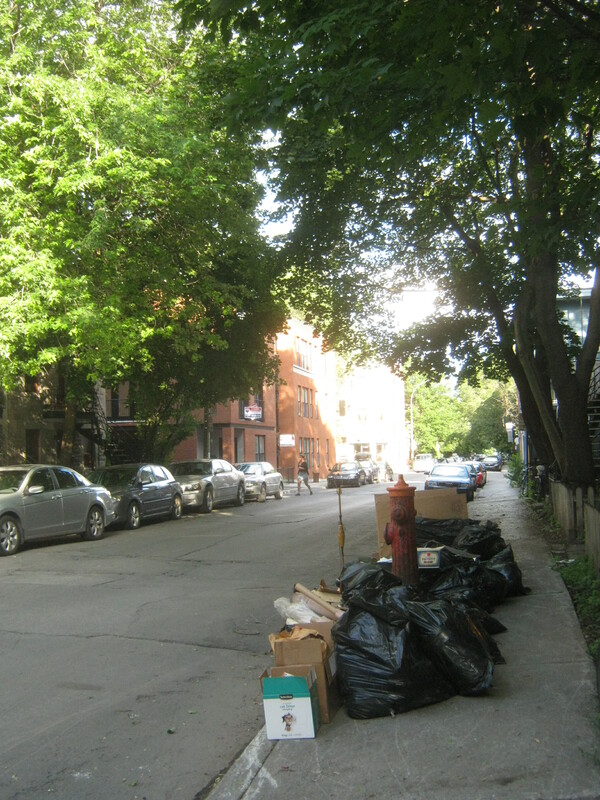 It’s the same in Outremont, NDG, TMR and VSL – these places are not without promise to be sure, but the finds are a bit few and far between for my liking. I’m thinking I’ll give my old route a second chance. Maybe I’ll try a later morning run, perhaps starting at 9 or 10 and see if that gives me a bit more to look at. I do have a history of finding things a bit late in Rosemont, with the most notable example being in February when I found several hundred dollars worth of gold jewelry at 2:30 PM, long past the time I expected to see trash on the curb. We’ll see in time, I suppose. It’d be nice if that worked out as I’d get to sleep in a couple more hours. 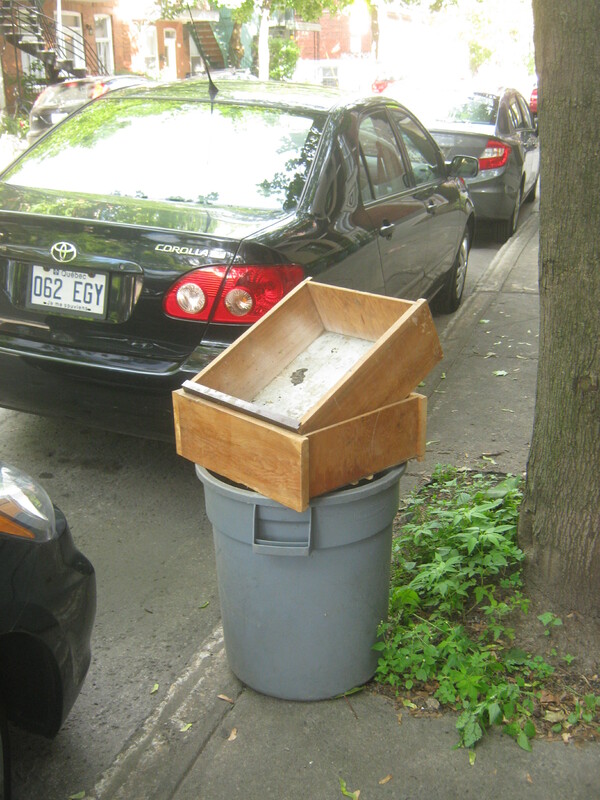 Regardless, I came across these boxes in the middle-class part of St Michel. There was some old pottery inside. 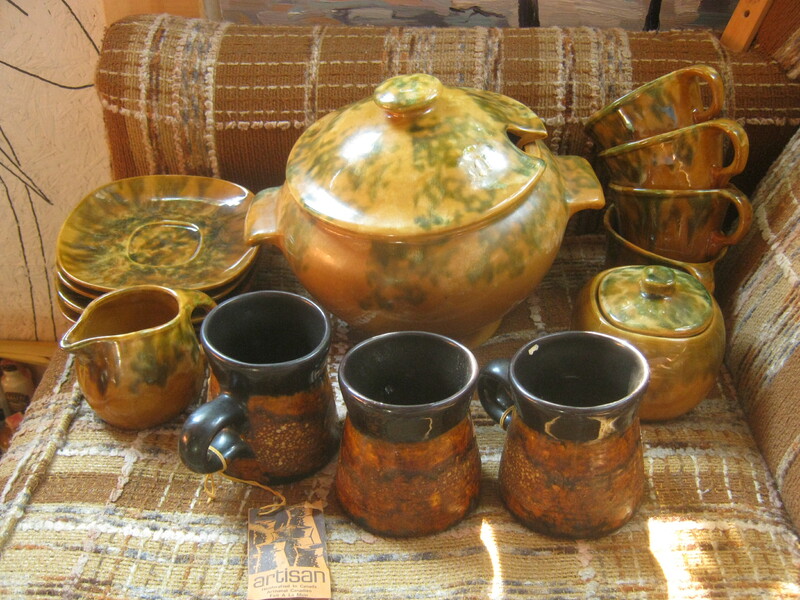 The stuff with the nice earth-tone glaze is made by Beauce, a now defunct pottery company out of Beauce, Quebec. This link explains the history of the company quite well. These pieces are likely from the late 1950s. They have some collectors value but don’t sell particularly well on Ebay. I’m going to put them in my yard sale along with the three hand-crafted mugs in the front. I found these boots in among a bunch of mostly renovation-related refuse. I took them home because I thought they looked interesting, well-made and vintage. They’re made by the Art Company in Spain. 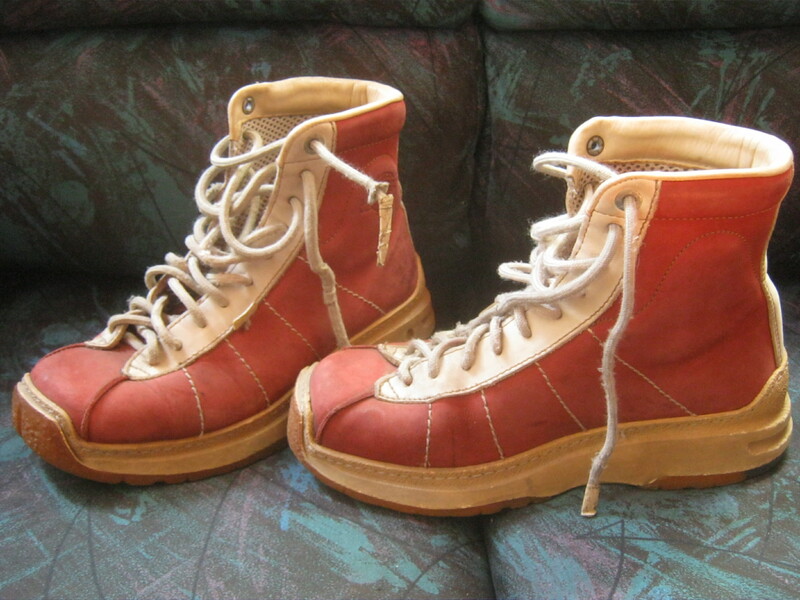 I couldn’t find any other examples of this boot, but as the company didn’t exist before 1995 these boots aren’t especially vintage and probably aren’t particularly valuable. Ah well, I think a friend of mine might like them and if not I can probably still sell them at the yard sale. The west Plateau trash day is later today. It’s near the end of the month so hopefully I find something good! Yesterday was a gorgeous day and I felt quite privileged to be able to be able to bike around looking for cool trash. I feel like I’m finally sitting some sort of stride with trash (and in life) by not expecting too much, appreciating how awesome it is to have this as a “job,” and just enjoying the ride. Even the flat tire half-way through my run didn’t faze my good spirits. Well, it did for a short time as I was angry at the city for not filling that big pothole I hit. However c’est la vie, as they say pretty much everywhere – fortunately I was close to home and I was able to borrow my room-mates bike to finish the trip. I found this book in a box full of recycles. 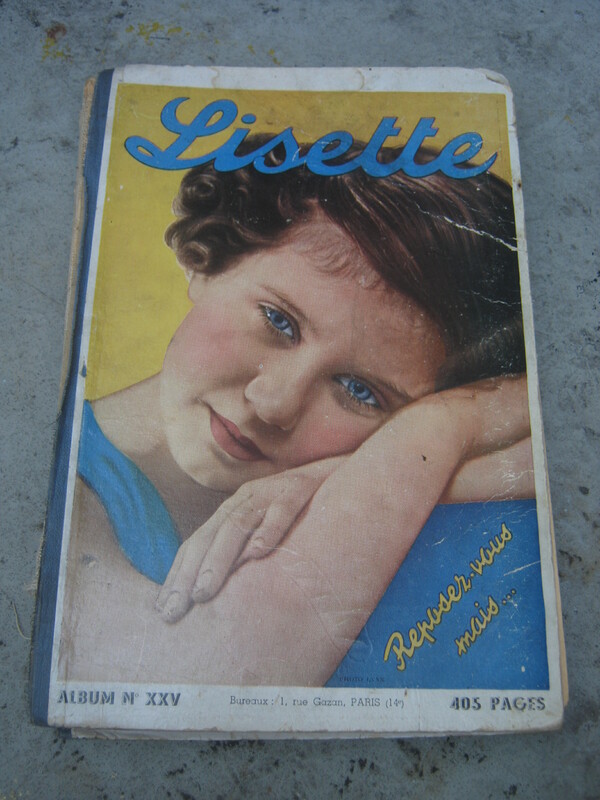 It’s a collection of “Lisette” hebdomadaires (weekly magazines) made in Paris in 1939. Not a year later Paris would be under Nazi control after the blitz that look over much of Western Europe. It’s nicely illustrated, filled with stories and random facts and whatever. It was likely a magazine for young girls. Someone is trying to sell a copy for 40 pounds (about 60$) online. My copy is missing the cover on the spine and would be worth a fair bit less. Still, it’s a good looking book. These plastic jello spoons were among a collection of stuff in the alleyway next to Brebeuf. It looked as if someone either moved or had passed away, it’s hard to tell sometimes. 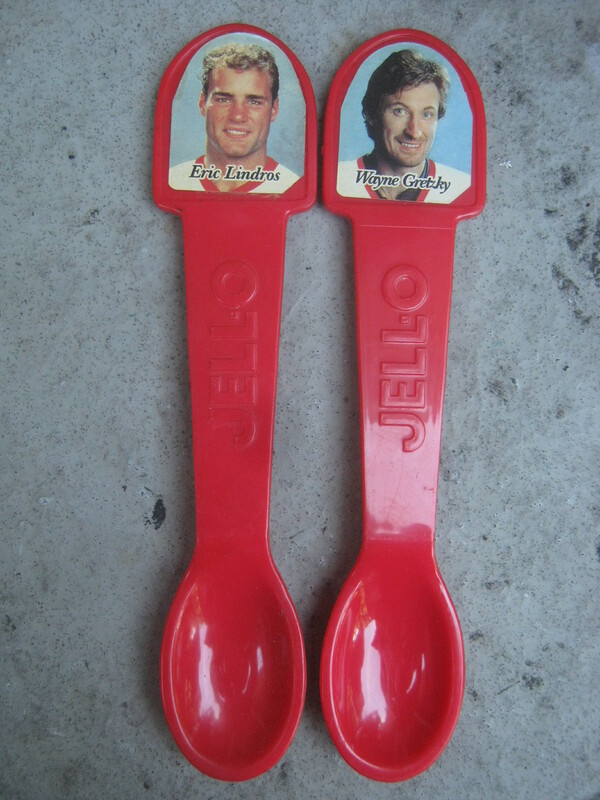 These spoons, featuring Eric Lindros and Wayne Gretsky, seem to be worth about 5$ each on eBay. The best find of the day, however, lay inside this trash can. I stopped my bike because of the old, empty drawers on top. Oftentimes people will take the contents of old drawers and throw them out as well, I’ve found cool vintage tools and other bric-a-brac this way. …big, heavy duty nail gun. 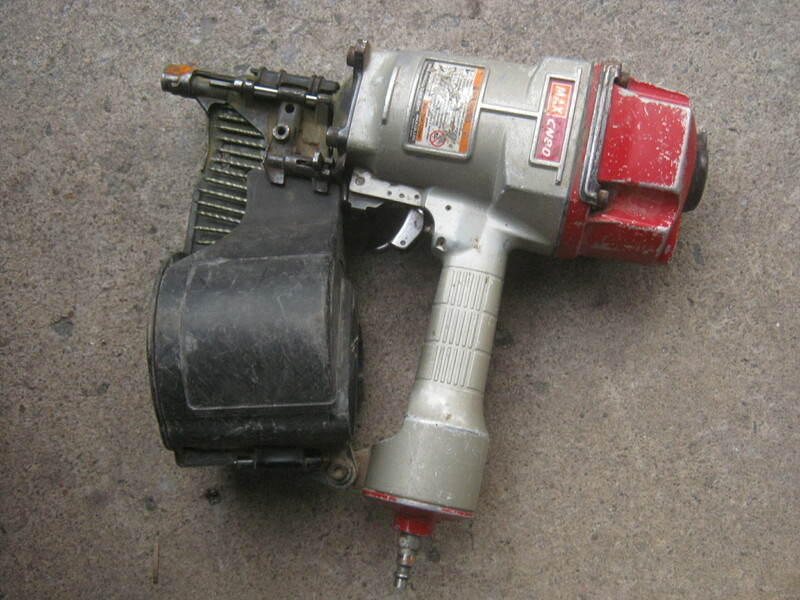 This is the kind of nail gun they use on roofs. I had a feeling that it worked fine and that whoever threw it out didn’t really know its value, maybe it was their parents or maybe it was in the basement when they moved into a new home. (A good garbage picking tip is to look for a “theme” as to why the thing or things were thrown out. There’s always a motivation behind the trashing regardless if it’s the “right” choice or not, and having an eye for the motivations that lead to good things being thrown out may help you take a chance on something you otherwise might not. It’s also one of your best tools at avoiding getting bedbugs). It was a heavy machine so decided to drop it off at home half-way through my mission. As I pulled it out of my backpack my neighbour walked by and inquired as to where I got it and whether or not it worked. He had a compressor (this thing worked on compressed air) so we arranged to meet up this morning to test it out. The nail gun ended up working fine and he asked how much I wanted for it. I sold it to him for 40$, which seems like a pretty good deal all around. I’m sure I could have gotten more otherwise but I gave him a good price because it would have taken a lot more effort to test and sell without his intervention. Plus, he’s a good guy and lives in my neighbourhood so I reckon it’s good for karma. Regardless, it was fun to liquidate this so quickly and get it in the hands of someone who can use it. Today I’ve got to fix my flat tire and perhaps adjust my steering bearings if I have the time. Beyond that, I’ve been working more at getting stuff on eBay and Etsy and dealing with my accumulated “garbage”. I might spend a bit of time cleaning some of my silver jewelry and putting it up on Etsy before kicking back and doing something more social.